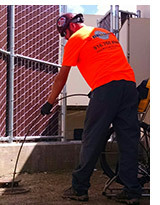 Our trained technicians video inspect residential sewer and drain lines with diameters of two to twelve inches. Sophisticated cameras capture crisp, color images of the pipe's interior, providing a clear visual of problem spots, breaks, and laterals. The footage counter pinpoints the images' exact locations and a locating sond provides the precise physical location of the pipe and problem. We don’t just flag the problem, though. We map out the path and depth of the system, in case a partial or full replacement of the pipe is necessary. On-screen texting, as well as voice-over capabilities, provide you with another layer of details specific to the inspection. And when the job is done, we save the inspection to a thumb drive.